The Prescription for Life plan calls for you to sustain your ideal weight. The question most people ask is how they can know what their ideal weight is supposed to be. There are many ways to figure what someone your particular age, or height, or body build should weigh, but when you get down to it, you will decide, and I won’t argue with you. There are average body weight tables you can find that give some idea, but you have to realize that the so-called average weight is probably too high for what you want to shoot for because so many Americans are overweight to begin with. So we are left with two options. Anything number over 30 is considered obese. Between 25 and 30 is called overweight. And, anything below 25 is considered a normal weight. You may feel comfortable with your present weight because you are in the “normal” BMI category. But, we shouldn’t stop there, since “normal” in the American diet is not exactly the best pattern to follow. This option is a more accurate formula that gives you a specific ideal weight to reach. It is strict but gives the best idea of what to aim for when losing and maintaining your weight. This second formula aims low, but there is nothing wrong with using these numbers as an initial consideration. For men, use 105 pounds as a baseline for the first five feet of your height, then add 5 pounds to that baseline for every inch over five feet. For women, use 95 pounds as a baseline for the first five feet of your height, then add 4 pounds to that baseline for every inch over five feet. Again, this gives you an approximate ideal weight, but you will have to fine-tune it for your body build. The weight-loss part of the Prescription for Life plan is an ongoing process—getting to your ideal weight and remaining there. 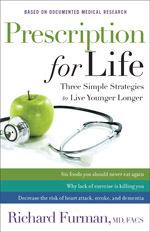 Get specific steps to help reach and maintain your ideal weight in Prescription for Life.